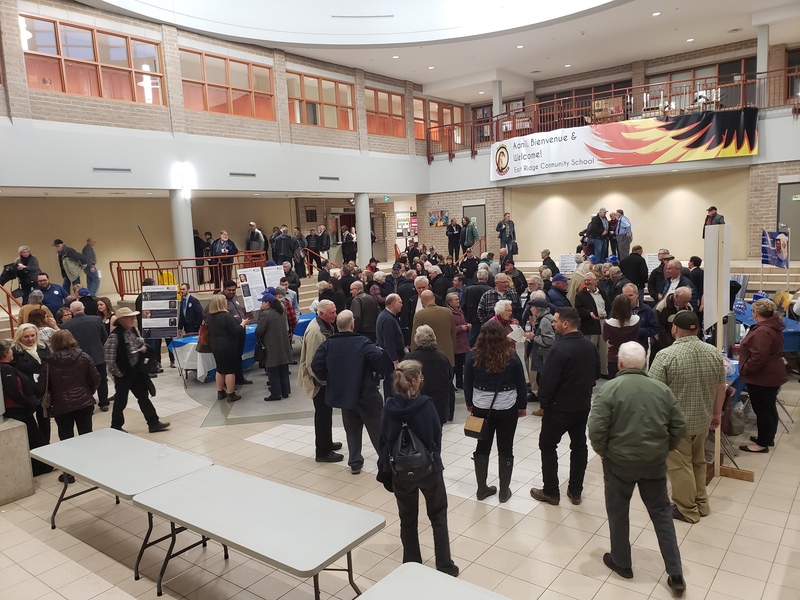 Bruce-Grey-Owen Sound residents packed the auditorium at East Ridge Community School Monday evening to hear speeches from the five candidates seeking the Conservative nomination to replace the retiring Larry Miller. Rick Byers, Paul Vickers, Ken Brown, Chad Richards and Alex Ruff each spoke for seven minutes before heading into the nearby foyer of the school where they spoke with constituents. All candidates seeking the nomination took a portion of their speech to thank the outgoing Larry Miller, who is not seeking re-election after 15 years representing the riding at Parliament Hill. Byers said he is running to restore confidence in the spending the federal government makes on behalf of the taxpayers. He’s been active with the party for five years and said he would advocate for better trade relationship management and more protection for agricultural producers. Vickers said he is running to take up the challenge of public service. He has experience as a municipal councillor and is a farmer, including 15 years in the dairy industry. He said he would not leave as much of a burden for the next generation, will advocate for a better balance between urban and rural, and reduce bureaucracy. Brown said he is running to support small businesses and farmers. He noted he is a lifelong hunter and will protect gun rights, and would use his connections gained through his experience in the oil and gas business. He said he will push for more funding for seniors and veterans. Richards pointed to his experience working directly with Miller as his parliamentary assistant, noting he has worked under Miller for seven of the 15 years he has been MP. Richards said he would hold quarterly town hall meetings, and set up local advisory panels to examine issues within the riding. He said the Conservatives need to become the “party of ideas”. Ruff said he is running to protect property rights, and begin more consultation with agricultural producers. He pointed to his experience in the military as a reason he is prepared to represent the riding. He says he favours pipelines, repealing the carbon tax, and more deficit control. He called Bill C-71 “useless”. Voting for the riding’s Conservative nominee will take place on April 22 at the school from 3 p.m. to 8 p.m.